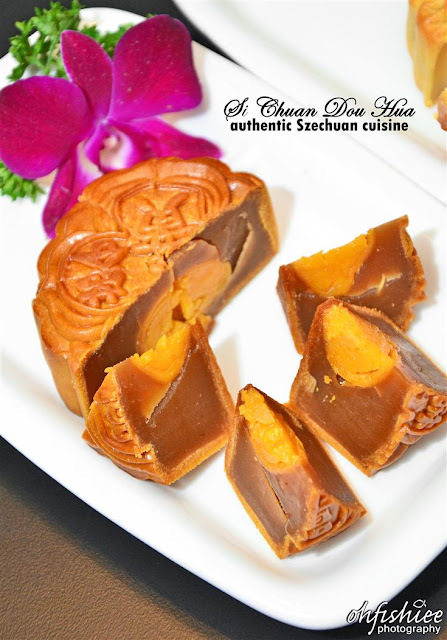 Back to the warm Mid-Autumn Festival of the year again, Si Chuan Dou Hua Chinese Restaurant spoils you with 6 irresistible choices of delectable mooncakes. My first thought was, "Only 6 flavours? Hmm..."
Back by popular demand, the exotic bird's nest mooncake takes centre stage this year. 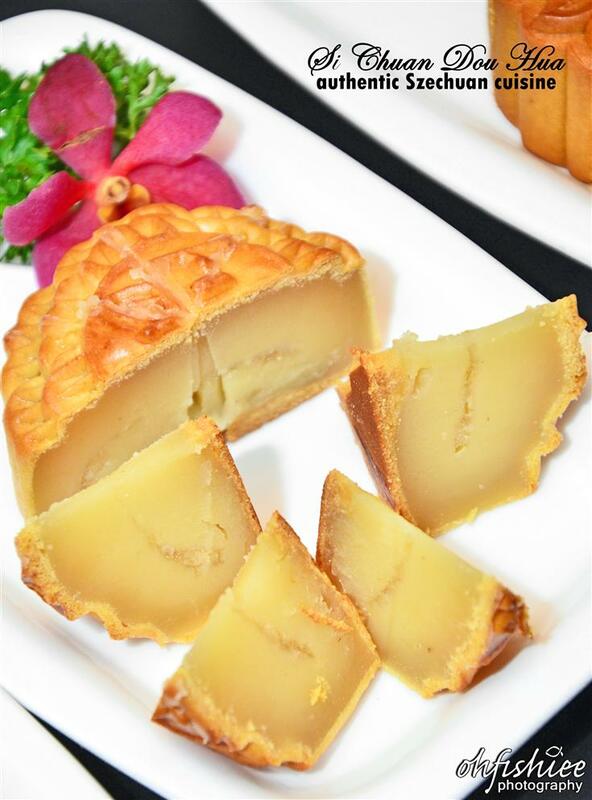 It features premium Bird's Nest filling, wrapped in a traditional thin baked skin. 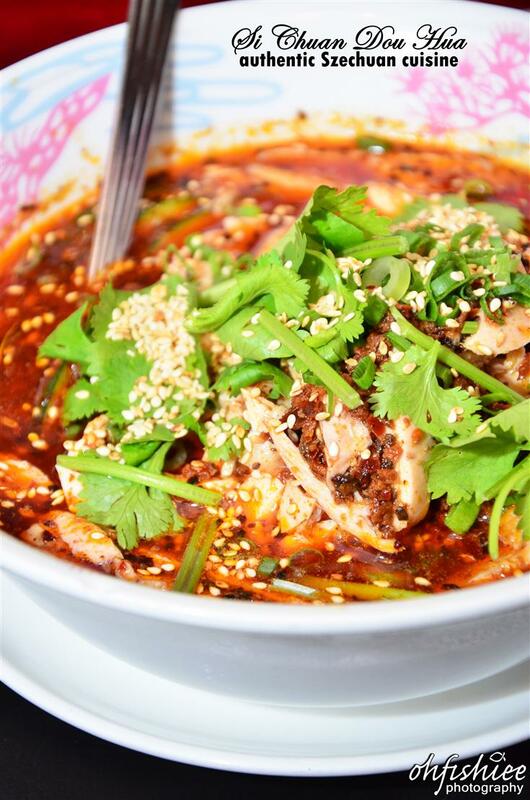 Every mouthful is satisfied with smooth, slimy shredded bird's nest! The paste is so much softer, making a delicate piece of treasure to enjoy. Those who prefer savoury mooncake can opt for the White Lotus with Shrimp Sambal that has minimal sugar added. It is interpreted with just the right measure of belacan to obtain that quinessential sambal character. A truly Malaysian taste! Moving on we have something great for coffee lover. I love the crunchy biting texture provided by the charcoal-infused baked skin, along with deeply rich milk tea flavour without overshadowing the lightly sweet mocha. Coffee lover like me simply couldn't resist this! 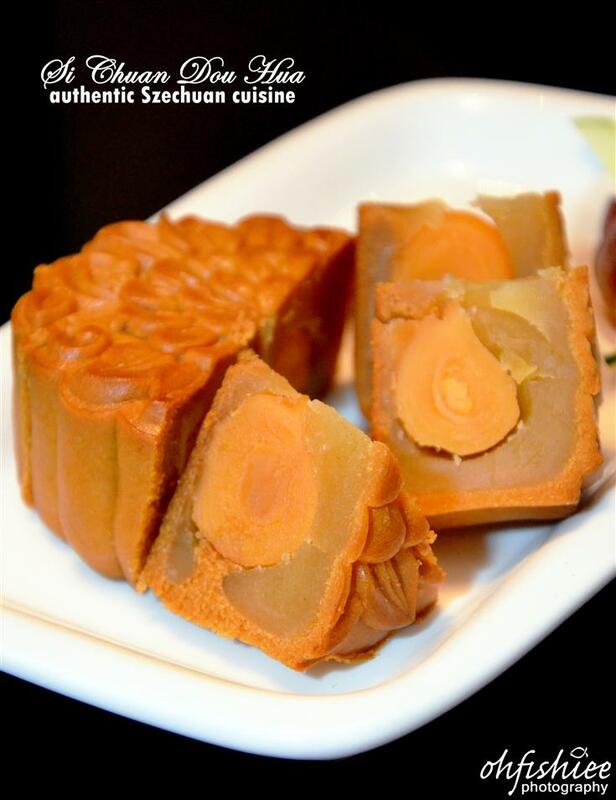 Back to the perennial flavours, they have smooth, premium lotus paste and egg yolk which is equally remarkable. Unlike many that I've sampled, the lotus paste here has a stronger aroma and softer texture. Definitely one of the freshest baked mooncakes I've enjoyed. Going slightly lower on the sugar level is the fragrant pandan paste with salted egg yolk. It is commonly available but not many can produce good ones. 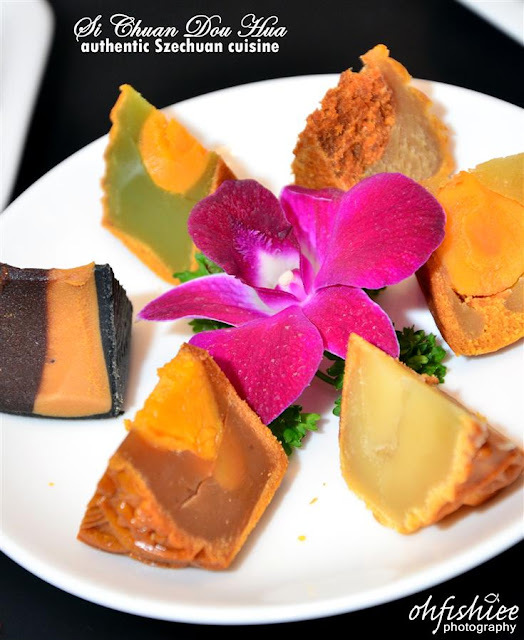 Here they have an exceptionally strong aroma of pandan, with perfect balance of sweet and savoury tastes. 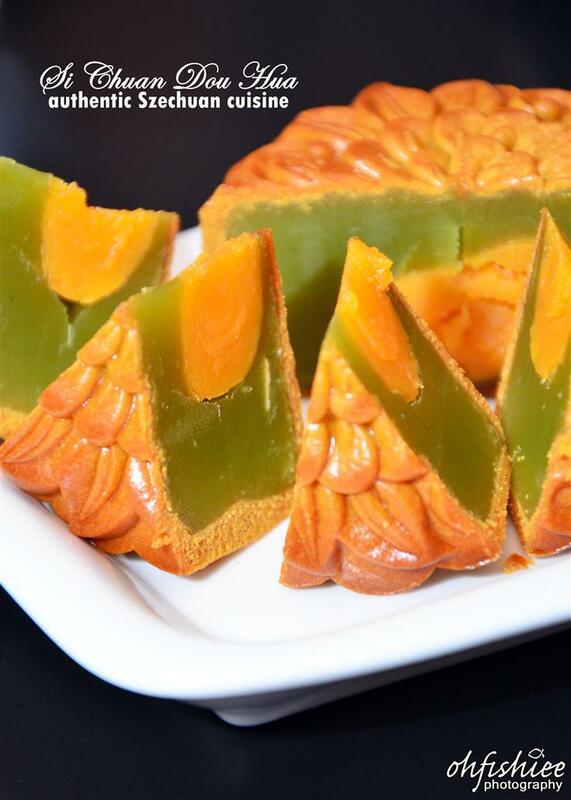 I can assure you that the pandan mooncake passes with flying colours! 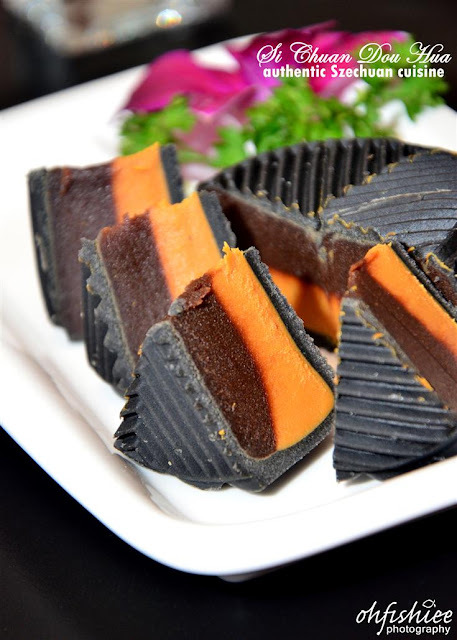 Targeted at the health conscious, you may opt for the less sweet version of mooncake. I find the paste just right, not sweet at all and complements well with the skin. 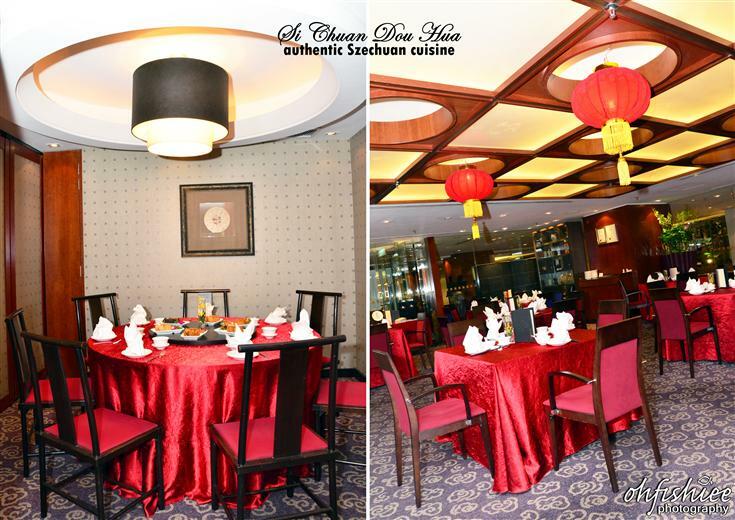 Being a pork-free establishment that serves authentic Sichuan and Cantonese cuisines as well as seafood and dim sum specialties, Si Chuan Dou Hua prepares us a memorable dinner at one of their private dining rooms. 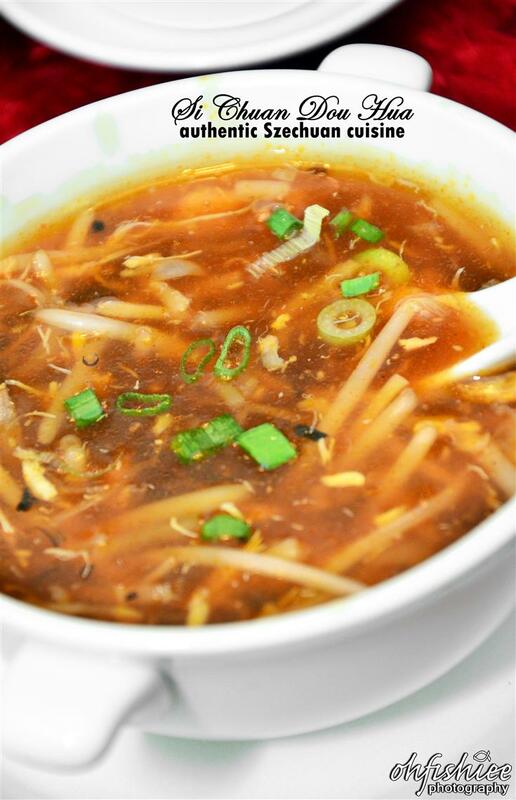 To start off with something light, we warm our stomach with the thick Szechuan broth stuffed with crabmeat and jellyfish, then garnished with spring onions and beansprouts. The soup does have the 'kick', but the spiciness is not overpowering and the meat's sweetness can be appreciated. 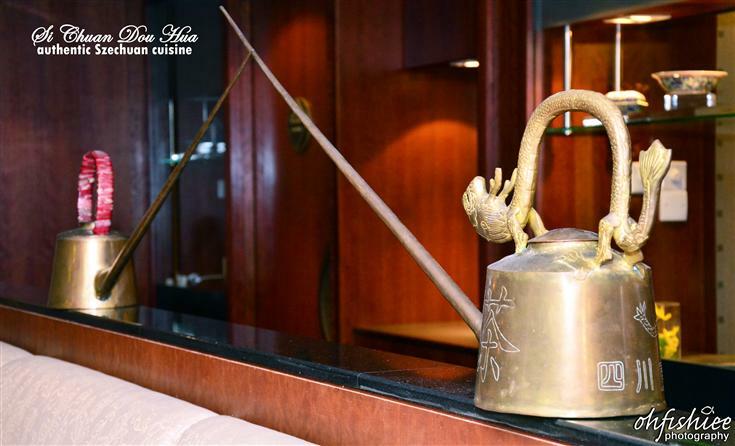 Among the many spectacular main courses, the cold chicken is the jewel in the crown. 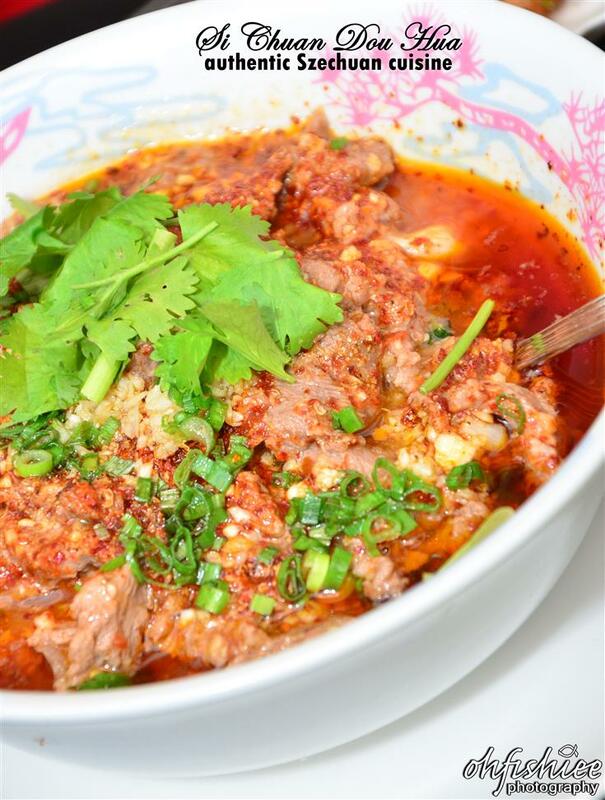 Being a traditional Szechuan cuisine, it is all about authentic flavours with numbing sensation in the meat dishes. Each fluffy slice of chicken is well-suffused into the hot peppercorn sauce, creating numbness on my lips along with the spicy savoury taste. 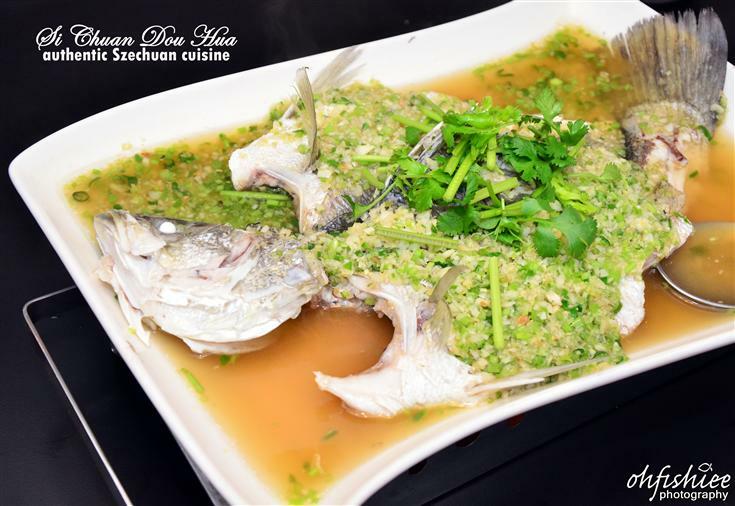 A close second is the steamed seabass topped with garlic and lemongrass. The accompanying sauce is a more pedestrian, but alluringly tasty light soy base. The lovely flaky fish is juicy and stuffed with garlic, served with a piquant lime light, this is a celebration of the vivid Thai flavours and I'd return just for this fab fish! Also recommended, the butter milk prawns that's been deep-fried to bouncy, fragrant perfection. Coated with a creamy spicy and sweet sauce, the fresh prawn balls were crisp and rich in flavours. The boiled sliced beef is an amazing dish, as I take in the thinly sliced layers of meat while it exudes a truly spicy and sourish flavour with a well-controlled amount of oil. Despite of the numbness it causes to my lips, I happily flood my bowl of steamed rice with the spicy savoury sauce. 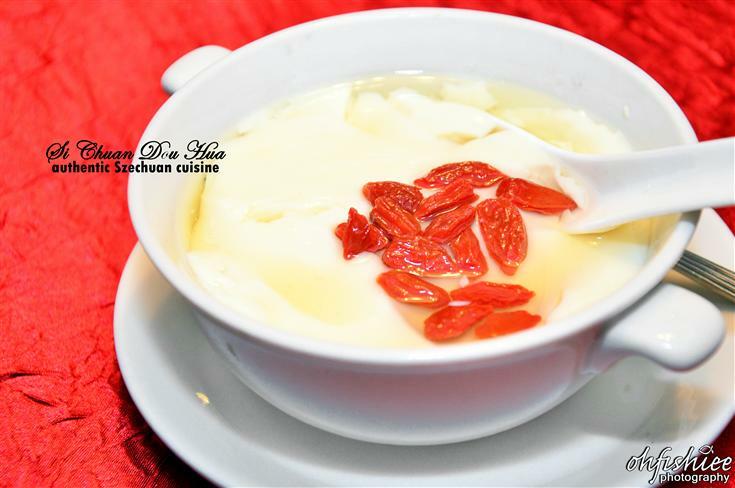 I'd surely want to try the eponymous Dou Hua ("Tau Fu Fah") as the extremely soft and smooth dessert is easy to sink into and melts in the mouth, leaving a moist sweet note with healthy wolfberry sugar syrup. The namesake dish is on almost every table- clearly a favourite! Clique, UOB, Standard Chartered, Hong Leong and CIMB cardmembers enjoy exclusive discounts. 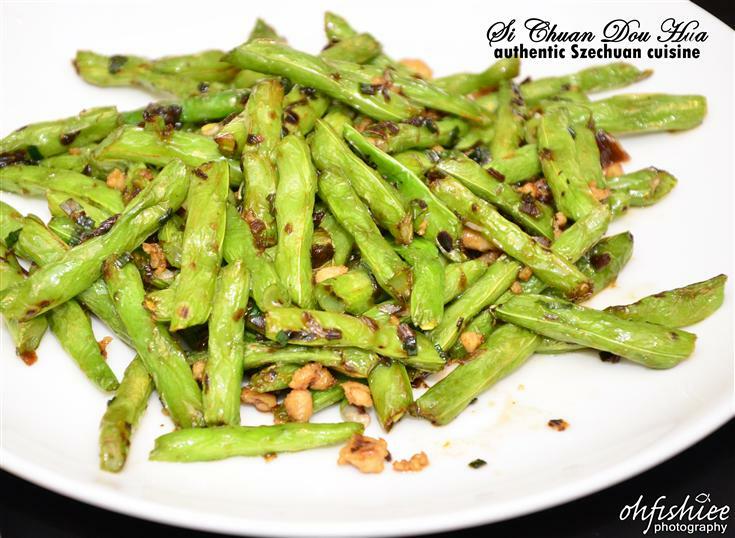 Call 603-2782 8303 for enquiries and bookings or visit Si Chuan Dou Hua Restaurant to place your orders. sour AND spicy is my favourite! 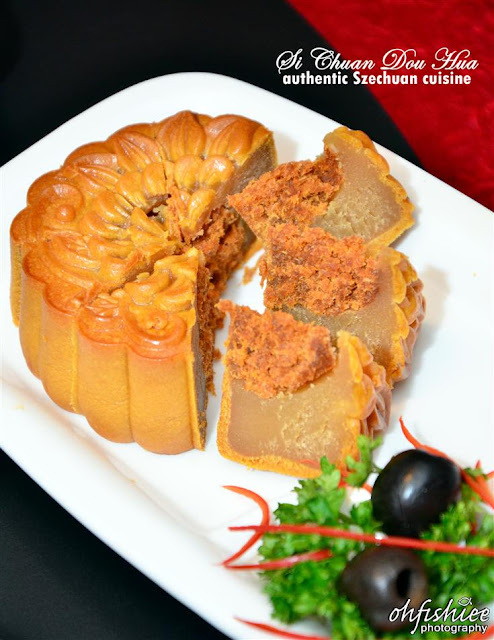 I haven't have any moon cake yet....Szechuan moon cake really looks tempting...yummy delicious. Pretty but really I do not agree witht the prices. It is not about what it used to be but just quite rediculous. It really has become a rich man's falovring the moon cake. It made us all forget about waht real meaning of Moon Cake festival is !!!! But great food photography, enjoyed it. Have a nice weekend, Fish !!!!! Wow! They have sambal inside too? wa, sambal!! I want to try too! Sigh!!! Don't think I'm going to get to eat any this year - too expensive, can't afford. 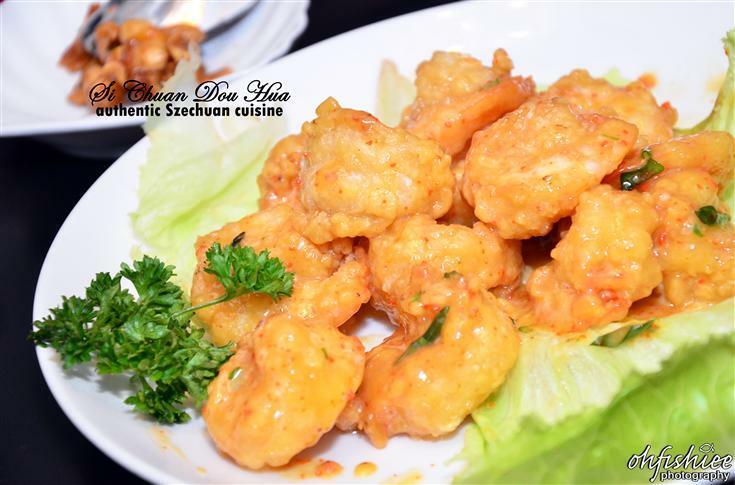 I would love those butter prawns though - look so yummy! Charcoal infused mocha milk tea sounds very interesting. Lovely mooncakes but since I don't fancy anything sweet, I will settle for the savory dishes. All of it that has the spicy and tangy taste is my kind of food. I love the boiled beef in spicy sichuan sauce here. addictively good. The Thai-styled steamed fish made me wanna take a bowl of rice and sit beside it. Wow. What fun and beautiful moon cakes! Wah very long spout kettle. I never try bird nest mooncake before. I am still very conservative in the mooncakes. I only like lotus paste or pandan paste. of all, I think i like the sour soup better. so cool! I wanna try the bird nest one! Need to quickly buy one, haven't bought yet this year.